Other photos: Photo 1, Photo 2, Photo 3, Photo 4, Photo 5, Photo 6, Photo 7, Photo 8, Photo 9, Photo 10, Photo 11, Photo 12, Photo 13, Photo 14, Photo 15, Photo 16, Photo 17, Photo 18, Photo 19, Photo 20, Photo 21, Photo 22, Manufacturer Provided Image. 2014 Intrepid 327 Open, Twin 300 Mercury engines with 350hr STILL UNDER WARRANTY! .All new Sea Deck and Upholstery Black Imron Hull Sides with Silver Accent Stripes. 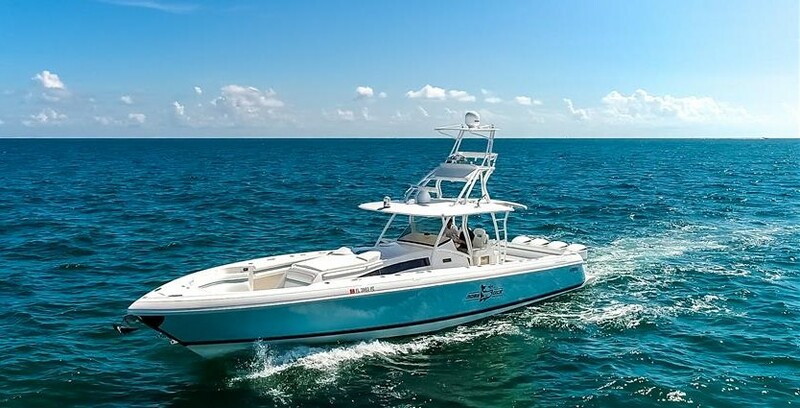 Bow Thruster, Windlass, Flush System,2x 5212 GPS/Plotter/Sounder, VHF,Full JL Stereo, Digital Depth, Bottom Paint,Forward seating With Electric Back Rests, Fiberglass Filler And Cushion For Forward Seating, Walk In Console With Electric Head, T-Top With Fiberglass Hard Top, Powder Coating, Live Bait Well, Under Water Lights, 5 Side Enclosure, Battery Charger, Loaded.